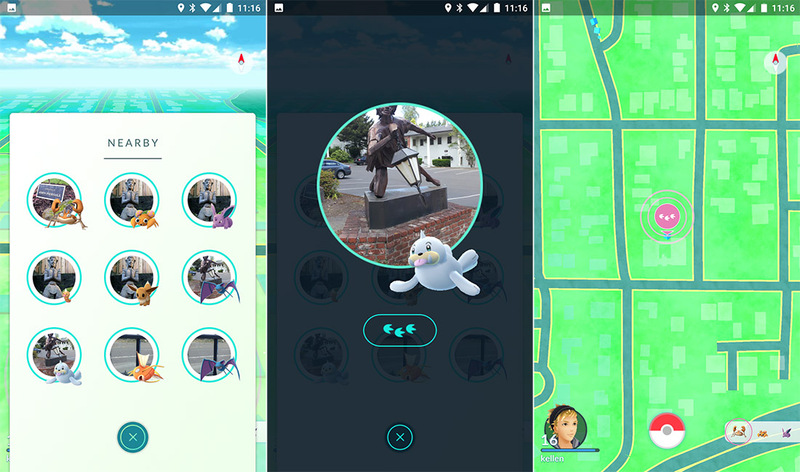 Back in August, when the popularity of Pokemon GO was already likely fading, Niantic pushed out a new Nearby tracker to beta users in San Francisco. The new tracker was largely thought to be a way for the game to stay relevant, but as months went by without it launching anywhere else and the ability to track new Pokemon became increasingly more difficult, most of us lost hope and gave up. Today, though, that tracker is finally arriving for many more people. Is it too late? You’ll have to decide. Along with that news, Pokemon GO is also getting double XP for the next week and has unveiled Ditto, a new Pokemon. How does the new Nearby tracker work? Basically, a tap on it reveals Pokemon at nearby Pokestops that you can go capture. It shows you who the Pokemon is, if you have caught them in the past, or a blacked out Pokemon if they are new. Tapping on an individual Pokemon in the tracker also reveals an aerial map of the exact location to help you get there. If this new tracker is the same as the previous test tracker, it should show nearby sightings as well. According to a blog post on the Pokemon GO site, this new Nearby tracker is now available to US players in “all states west of the Mississippi River (except Hawaii and Alaska),” Canada (BC, Alberta, Saskatchewan, Manitoba, and the western half of Ontario), and Australia. As for that double XP deal I mentioned in the opening, it starts now and runs through November 30. While playing, you will receive not only double XP, but double Stardust when completing in-game actions.